Between 1919 and 1921 the first stamps of Azerbaijan were all printed in Baku and all printed by lithography. The paper used was in very large format - most often, a full sheet of news-paper - with two or three hundred stamps fitted on to the sheet. This has attracted the attention of several prominent collectors interested in plating: Voikhansky in Azerbaijan and Peter Ashford and Ian Baillie in England (where many of the sheet remainders were exported by the Soviet Philatelic Agency). 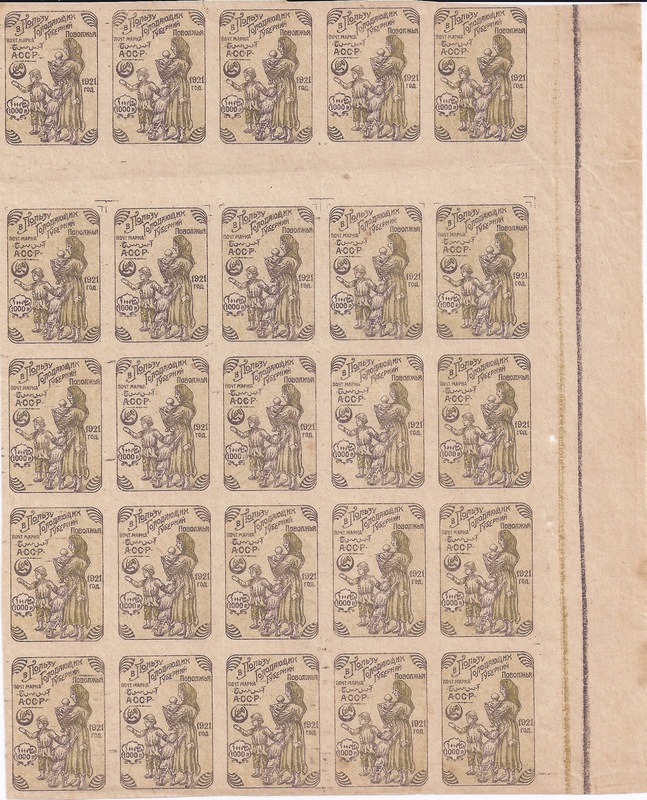 There were two printings of the first (Musavat) stamps and for the second (Soviet) printing some sheets were reorganised. There was just one printing of the Soviet pictorials and the Famine Relief issue. Most sheets contain one or more gutters, horizontal and vertical. The main gutter which divides top from bottom or right from left to create two half sheets is rarely found intact. It seems that the difficult- to- handle big sheets were cut in two before being sent to post offices. 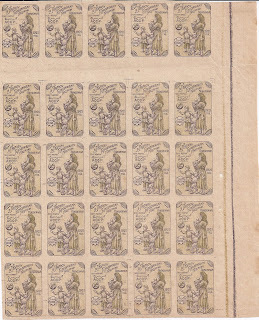 The 1000r Famine Relief stamp shown at the top was printed in a sheet of 15 across and 18 down (270 stamps) with a single horizontal gutter between Rows 9 and 10. The block above (ex - Ian Baillie) is the first one I have seen with a gutter. You can also see very clearly across the top of Row 2 the guide marks used in the transfer of the plate block of six (2 x 3) to the large lithographic plate. There are both outer marks every second stamp and individual corner marks on each stamp. Normally, such marks were cleaned off the plate before use and it is unusual to find them so clearly as on this value. The 5r block below is also unusual. It is from a re-set plate used for the Soviet reprint. There are no wide horizontal or vertical gutters. Instead, each transfer block of six (3 x 2) is separated from the one below by a slightly wider margin than within the transfer block itself : about 6.5 mm instead of 4.5 mm. This pattern is not, however, repeated horizontally. To a modern eye, these first stamps of Azerbaijan may look "primitive". However, the printing process was actually complex and sophisticated. Very large lithographic plates were created using complex transfers and "infilling" to deal with single rows or columns left over after the regular transfer process was completed. Though minor colour shifts and offsets are frequently found, major varieties - dramatic colour shifts, missing colours, inverted backgrounds - are rare. So too are proofs and printer's waste. The printers in Baku behaved like modern "Security Printers" - in fact, more so: they did not have anything going out the back door to supply the needs of the stamp trade!